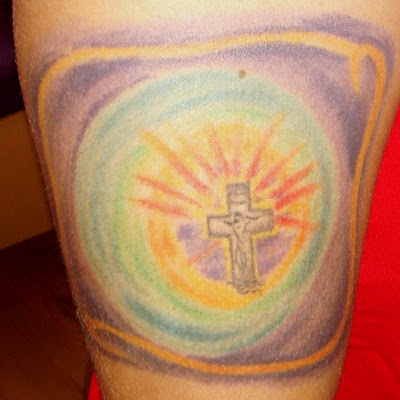 When, on July 31, 2007, I posted my first installment of the weekly Tattoosday feature on BillyBlog, I didn't know what I had started. Had you told me then that, a year later, Tattoosday would have spun off from BillyBlog, that it would have set a personal best in July '08 with over 13,000 hits, and that I would be posting daily, I would have been skeptical. Nonetheless, that's what has happened. And, although I expect a drop-off in visits as summer ends and shorts and tank tops give way to jeans and long-sleeve shirts, I am pleased with how Tattoosday has progressed. I want to thank everyone who has visited and contributed to the success of Tattoosday. It's still a little baby blog by blogosphere standards, and its stand-alone self (apart from BillyBlog) doesn't celebrate a full year until September 8, 2008, which is BillyBlog's 3rd anniversary. The lingering question is this: will Tattoosday surpass BillyBlog in traffic by then? As of July 31, Tattoosday had just over 48,000 hits in a little less than 11 months, whereas BillyBlog is at 63,500 hits just a month and change shy of 3 years. Check back on September 8 to see what happens. On Monday, I ran into two hair stylists walking west on 23rd Street. Both were inked, and both graciously agreed to share one of their tattoos with us here in the blogosphere. The photo above is one of three pieces that Mona has. She currently has a sleeve in progress. This pocket watch will eventually be part of a unified sleeve, but Mona explained how this stands apart from the rest of the design. She identifies the pocket watch with her grandfather, who she always remembers had one on him at all times. His surname was Baltazar and, despite being adopted, she shares his family name. The (time) piece is dedicated to him. This tattoo was inked by Regino Gonzales at Invisible NYC. Thanks to Mona for sharing her tattoo, along with her memories of her grandfather, here on Tattoosday. See below (or here) for her friend Kara's tattoo. In the post above (or here), I met two hair stylists this past Monday, who both had tattoos. 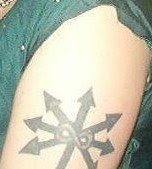 The photo above is of one of three tattoos on Kara. Kara is a Pisces, born on March 3, and she found a design that she liked to represent that aspect of her. 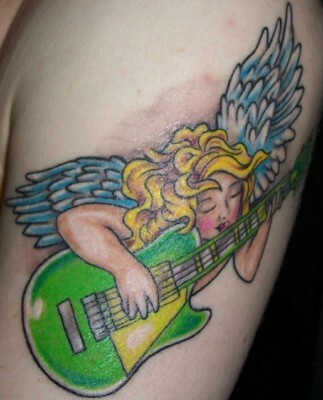 This tattoo was inked about six years ago at Allstar Tattoo in St. Louis, Missouri. Thanks to Kara for sharing her tattoo here with us on Tattoosday! Just a production note, one of my June posts has been picked up by a site devoted solely to knuckle tattoos. Click on the title of this post to check out the site here. I exchanged e-mails with Nathan, who runs the site, and he had kind words to say about Tattoosday. Should I run across any more knuckle ink in the future, I'll be sure to send them his way. This is a continuation, of sorts, from a previous post here. Claire showed me the above trio of tiny tattoos on her left hand. She explained that they represented her three favorite things. A strict literalist would interpret this as diamonds, martinis, and cash, but one could be more general and call them alcohol, jewelery, and money. Or, if one wants to be alliterative and hip, "booze, bucks, and bling". She doesn't remember the shop, but she had these three tattoos inked somewhere in Jersey City, NJ. Thanks again to Claire for participating in Tattoosday! As I approach a year of writing Tattoosday, I like to think that, within the first fifteen seconds of talking to an inked person, I can tell whether they are going to be interested in sharing, or are going to politely (or impolitely) decline. When I first stopped Heather last week, on Seventh Avenue near Macys, I guessed it was a futile attempt. Her tattoo spread from her back over to her shoulder and down her right arm. There was a layer of clothing covering parts of the piece. Generally, these tattoos are tough to capture on film, and subsequently, I end up disappointed. Heather is a wildlife biologist, born and raised in North Carolina, and she has a themed sequence of tattoos going, that she hopes to build some day into a full sleeve. All of the elements are species native to her home state of North Carolina. 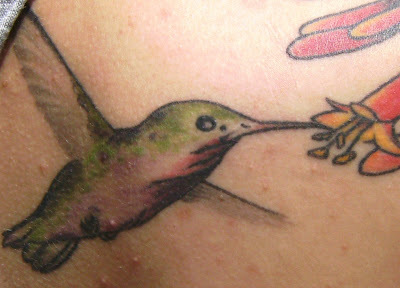 Beginning with the back, and detailed in close-up at the top of this post, is a ruby-throated hummingbird. The bird is fluttering about a flowering plant of coral honeysuckle. This plant wraps from her back onto her upper right arm. There it mingles with some sourwood. Heather was clear to point out that it was an artist's representation of sourwood (aka the Sorel Tree), and not true to the actual species. All of her amazing ink was done at Blue Flame Tattoo, in Raleigh, North Carolina. Two artists there were responsible for her work, Mark and Christy. The star is actually my first tattoo. I got it on my 18th birthday, June 13th 2000. I thought I was really tough. Ha ha it's funny to think about now. The tattoo only took 40 minutes, but I passed out. Word to the wise: always eat before a tattoo. So that is that. Thanks to Heather for sharing her beautiful tattoo(s) with us here at Tattoosday! I met Claire last week, a couple of buildings down from where I work in Manhattan. I first noticed some script pieces she had on her inner wrists, but she unveiled this beauty of a sugar skull for Tattoosday. She had this inked on the inside of her left bicep as a memorial to her grandmother, who had passed away. One of her favorite Catholic holidays had been the Day of the Dead, and Claire saw this design as a fitting tribute to her. Although sugar skulls come from Mexican culture, their root is in Catholicism. People see sugar skulls in many different ways (see previous sugar skulls posted on Tattoosday here), and Claire sees them as celebrations of life, which made the piece so fitting as a memorial. This was inked by Alex Franklin at Brooklyn Ink. See other work from Brooklyn Ink on Tattoosday here. Claire is a talented photographer whose work can be seen on her website here. This is just one of 17 tattoos Claire has. See three more "small" pieces she has here. Thanks to Claire for sharing her work with us here on Tattoosday! Sorry. Couldn't resist that title. 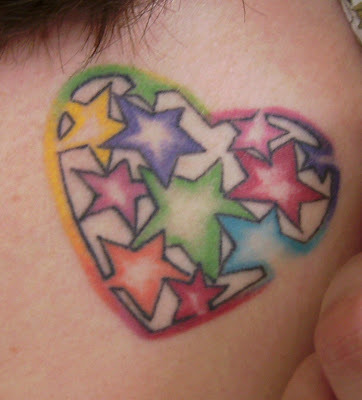 I ran into Damien near Fashion Institute of Technology earlier in the week, and her bright, colorful tattoo just jumped right off of her in the sunlight. She stumbled upon the photo on the NASA website and loved the shape of it. 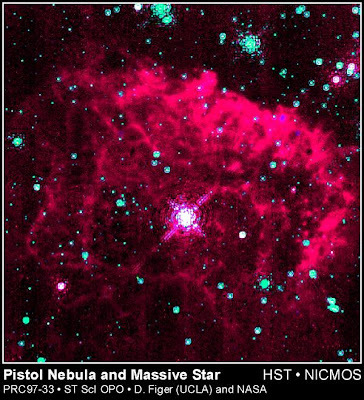 Anyone who has seen the photos from the Hubble, which are in the public domain, should agree that they are spectacular visions from beyond our world. The book designer and novelist Chip Kidd coincidentally posted this past week, on his website about a new book for which he had designed the cover (here), the images on which were from the Hubble eye on the universe. This piece was inked by Chris Kowalski, a tattooist in Toronto at Abstract Arts Tattoo and Body Piercing, and is one of seven tattoos that Damien has. Aside from the symbol for infinity and the arrows pointing out from all directions, I cannot speculate on the meaning of this earlier tattoo, but am hoping she will offer up an explanation at a later date. Thanks to Damien for sharing her galactic ink with us here on Tattoosday! I was hesitating whether or not to ask Dara Zad about her tattoo that wraps around her left ankle. She has the word "Fragment" inked above her foot and, whereas a passer-by might dismiss it as a band name or a random word, the piece carries a depth of meaning about which Dara is clearly passionate. "Everything is a fragment if it's taken out of context. Like in natural history museums, if you look at one thing by itself, a spoon for example, it is regarded as an artifact, but it is irrelevant by itself, it is only a fragment of a larger group of items. My leg is a fragment of me and I am a fragment of the universe." Dara is a video artist, whose website here has some samples of her work. Check out, for example, her short film "The South Maple Bridge". It's pretty cool and worth a few minutes of your time. This tattoo, one of four she has, was inked at a shop called Lunar Tattoo and Piercing, in Hadley, Massachusetts. The artist was Mark Bode. Thanks to Dara Zad for sharing her fragment with us here at Tattoosday! I ran into Sam outside of Rite-Aid in my neighborhood, and she let me take a picture of the tattoo above. Sam has a handful of tattoos, all meaningful, but we selected this one, on her right shoulder. The lotus has an interesting look to it. She had wanted it to have a distinct pastel appearance and is happy with the way it came out. She later had a different artist ink a corresponding lotus on her left shoulder, but the ethereal effect did not quite have the same result in blue. Sam explained that she hails from a small town where, unfortunately, there's at least one suicide a year among the younger population. As troubling as this was, it never really hit her hard until one of her friends took his life and became one of the statistics. Complicating matters was that a handful of others followed suit, making the experience even more trying. She helped her own healing process by getting this tattoo. More important than the lotus' meaning as a life-affirming flower, Sam, like many people, find that being tattooed is a transformational experience, relieving her stress and pain. 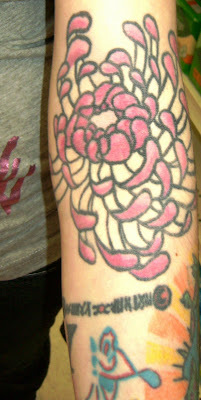 She hopes to build off of this lotus and eventually ink a larger piece, in the quarter to half-sleeve range. Any interested artists should e-mail me and I can put Sam in touch with you. The lotus was inked by Monique at Lotus Tattoo in Patchogue. Monique, she understands, has left that shop and relocated somewhere in Brooklyn. The shop, as well, seems to have shuttered its doors as well. Thanks to Sam for sharing her lotus with us here at Tattoosday. I was waiting for a prescription at Rite-Aid, on Thursday, July 17, which had already been a record Tattoosday. I saw a familiar-looking guy with the tattoo above on his forearm. I asked him about it and he recognized me as the father of my two daughters who used to go to an after-school program where he had worked for a spell. He was more than happy to explain this interesting tattoo to me. It is a Native American medicine wheel that he designed and brought in to Kings County Tattoo Company where the artist, Paulie, transformed it into a tattoo. Paulie has been mentioned previously on Tattoosday here. Kings County Tattoo has had work featured on this site here. 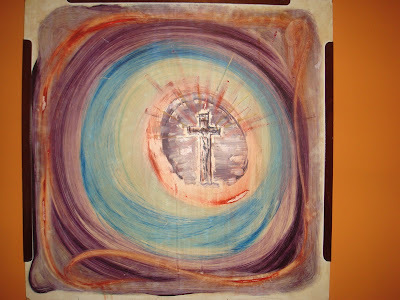 Sal explained that the outer part of the wheel is comprised of four colors: red, brown, yellow and white, each representing one of the races of humankind. The crane features prominently in the piece because it is the symbol for the Baswenaazhi clan in the Chippewa tribe from which his father (and thus, he) is descended. The thunderbird represents strength. The spiral equals life. And the arrows are emblems of Native American culture. The 8997 represent the date August 9, 1997, the anniversary of his parents' marriage. The entire piece is an elaborate tribute to Sal's family. I thank him for sharing his medicine wheel with us here on Tattoosday! I met Bryan last week outside of Penn Station. He has "7 or 8" tattoos, and he offered up this piece from his left leg. It's a recreation of a pulp book cover that depicts a woman holding a photograph of a crime in progress, just as the man in the photo who is the perpetrator, is entering the room, gun drawn. The woman appears to have just developed the picture and her face is wracked with frightened recognition of the fate that is about to befall her. Bryan recalls coming across this image when he was a teenager. I have a distinct feeling that I've seen this image before as well, but I was unable to find the source material. 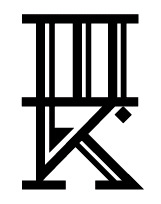 If anyone knows the title of the book upon which this tattoo is based, please let me know. Bryan also likes the core element of photography within the tattoo, as he has always been interested in that art form, and he still considers photography a hobby. This piece was inked by Jason Goldberg at Olde City Tattoo in Philadelphia. 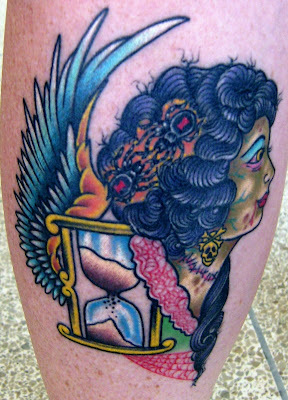 Thanks to Bryan for sharing this amazing leg piece with us here at Tattoosday! I ran into Erik at the laundromat and snapped this shot of one of his many tattoos. It is located on the inner part of his right bicep. Erik explained that his grandfather and many of his uncles had been ship captains and this was a way to honor them with something significant from their family history. It also is a nod to Erik's love of pirates. You may recall, this is two weeks in a row I've snapped pirate-themed tattoos in the laundromat. The previous post is here. This tattoo was done by none other than Joe at Brooklyn Ink. Previous Brooklyn Ink tattoos can be viewed here. Thanks to Erik for sharing his cool tattoo here at Tattoosday! 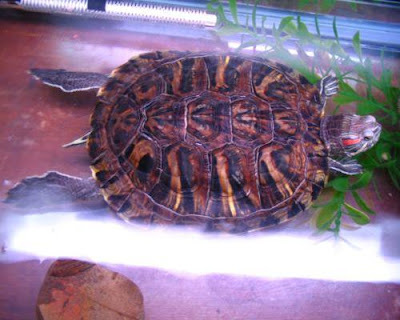 Yes, the Red Slider is a turtle, and the one on Lorraine's left foot is practically crawling off her skin. She loves turtles and wanted to pay tribute to her amphibious friends. Her tattoo was inked at Studio Enigma in the Howard Beach section of Queens (not to be confused by Studio Enigma on Avenue U in Brooklyn). Her artist was Freddie. Thanks to Lorraine for sharing her tat-turtle with us! On Thursday, July 17, I spotted Becky outside of the Penn Plaza Borders talking to her friend Ashley. Becky's not hard to miss, she's a striking young woman with twenty-seven tattoos. And, whereas generally Tattoosday participants are open and happy to share their ink here, both Becky and Ashley's kindness and friendly dispositions further brightened my day and reminded me why I love working on Tattoosday. 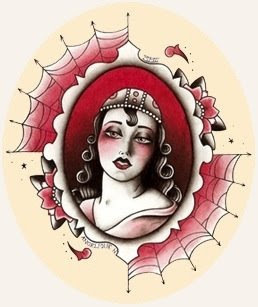 The tattoo is based on the artwork of Angelique Houtcamp, an artist who is often referred to as "the inspirational Dutch tattoo mademoiselle of the contemporary art world." Her artwork is much admired and both Becky, as well as her tattooist, Mohawk John. The majority of Becky's work was inked by Mohawk John at B-52 Tattoo in the Williamsburg section of Brooklyn. As you can see, he did a phenomenal job recreating Houtkamp's work on Becky's skin. Thanks to Becky and her friend Ashley (whose Tattoosday offering is in the post below) for sharing their tattoos! More of Angelique Houtkamp's artwork here. See Becky's friend Ashley's Tattoosday offering here. I met Ashley when I approached Becky (her post here) about her work. Unlike Becky, who is inked 27 times, Ashley has just four pieces, none of which are immediately visible. However, after talking with her friend Becky, I queried Ashley about any tattoos she might have, she offered up the small piece above. Ashley's friend Turner Walker is an aspiring tattooist who is learning the art form. Turner, with whom she had gone to school, asked if he could practice on her and, when she assented, he placed two small red hearts on either side of the middle finger on her right hand. She laughs about it, thinking it's cool that wherever she goes, she'll have a piece of him inked on her body. Personally, I like the fact that she has a couple of hearts inked on a finger that is often misused by humans to make an unpleasant gesture. Thanks to Ashley for sharing her small heart with us. True friends let their friends practice tattooing them! I spotted Mike and Tracy on 34th Street on Thursday, July 17. They were the third and fourth people I photographed that day. Mike had the logo from his favorite band, The Misfits, on the back of his left calf. It's one of his three tattoos. Both Mike and Tracy, visiting New York from San Diego, had their work done at their local shop All-American Tattoo Company. Stevie inked the Misfits piece and "Little C" did the work on Tracy's bicep. Thanks to both of our visitors for sharing their ink here at Tattoosday! UPDATE: Mike sent me the link to his band's MySpace page. They have a great name, The Filthy Few. Check them out here. rooster from New York Adorned, some less-than-interested dudes going to the Bon Jovi show at the Garden, and lots of inked folk walking with their kids -- I generally let them be). Since 6 of the 8 people were hanging together in pairs, I won't break up the sets, if I don't have to. But I'm going to drop the first pair in a post right below this one. I ran into Shawn and Chris from Albany outside of Penn Station on Thursday, July 17. Both were heavily inked. Of their many tattoos, one had some additional meaning, and it was one that they both had on their lower shins. In fact, they told me, there is a group of about twenty of their friends with the same tattoo. A while back, one of their good friends, a personable guy nicknamed "F-Bomb," passed away suddenly due to some complications from a diagnosed, but not necessarily life-threatening health condition. It was a great shock, and not only did his large circle of friends band together to help F-Bomb's mother pay for the funeral, but they all got the same tattoo to memorialize him for the rest of their lives. The tattoos are credited to artist Christian at the Dead Presidents Lounge in Albany, New York. Thanks to Shawn and Chris for sharing a little of F-Bomb here on Tattoosday. I was on my way home when I spotted Lisa, who was with a friend, in the hours before Bon Jovi's second night at Madison Square Garden. I asked instead, about the two I had spotted, the ink that was on the back of her legs, down by the Achilles' heels. Lisa stated she was "on the cusp," so she related to both astrological signs in proximity to her brithday, July 23. Alas, Lisa was in a hurry, and my still-working-the-kinks-out camera was stuck in sunrise mode. The end result is a little blury - Lisa, don't forget to email me better pictures! Ashley has this tattoo on the back of her neck. The lines "I will not lose hope/I will not give in" are based on lyrics from a song called "The Crimson" by a band called Atreyu. The lyrics were words commonly uttered by Ashley's best friend and cousin, who died a couple of years ago. He committed suicide after learning he had a serious illness. She and another cousin chose to honor his memory by having the lyrics tattooed on them as a reminder not only of someone near and dear to them, but because the message transcends death and affirms life. Even though her friend succumbed to suicide, the memory of him instills strength in her even though he is no longer part of the physical world. As Ashley indicates, she chose the back of her neck because she "can't see it, but I know it's there," just as she can't see her departed friend, but knows that he is still with her. This tattoo was inked at Body Designs in Bay Shore, New York. Thanks to Ashley for sharing her tattoo and the personal story behind it, here on Tattoosday! I ran into Alex at the laundromat and complimented him on the name inked on his left forearm. The piece is a tribute to his son Julian. As a fellow father with tattoos honoring one's kids (see one of them here), I certainly appreciated the sentiment. This piece was done by an artist named Salem, who is part of the DFM crew in San Francisco. Another interesting fact about this piece is that it is on Alex's left forearm. Both he and his son are left-handed, and Alex's four other tattoos are on the left side of his body. He strongly believes in inking only on that side of his person and does not intend to ever ink the right side of his body. Thanks to Alex for sharing his ink with us here at Tattoosday! I ran into Pete at the laundromat and he offered up this tattoo. He had this inked on his left side because he is infatuated by pirates, something he never grew out of from childhood. This tattoo is about two and a half years old and was done by his friend Pee Wee at Cutting Edge Body Arts in Manhattan. Pete has seven tattoos in all. Thanks to Pete for sharing his pirate here at Tattoosday! Bridget also has a back piece which she couldn't show me, but hopefully she will send me a photo for a later post. Update July 27, 2009: Stacey now tattoos out of Inkpulsive Custom Tattoos. I met Randy in front of Penn Station, where he was talking with Cait. I spotted what appeared to be a Chilly Willy tatoo on his inner right forearm, but he dismissed it as a youthful mistake that he eventually wanted to get covered up. He got the three stars to remind him of youth and romance, an allusion to how kids tend to draw on themselves, often scribbling stars. The piece was inked at Lotus Tattoo in Sayville, N.Y. Thanks to Randy and Cait for sharing their ink with us here at Tattoosday! If you haven't met Fabiana's ink yet, you may want to check out her previous posts here and here before continuing. 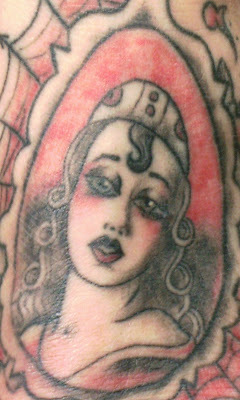 The above tattoo is on her right bicep and has a remarkable story behind it. Sadly, her dad passed away about a year later and Fabiana's mom, wanting her family to have a better life, moved them all to the U.S.
Years later, as an adult, Fabiana decided to honor her father: "I thought about the painting and said Wow, it would be great to have a piece of my dad on me . 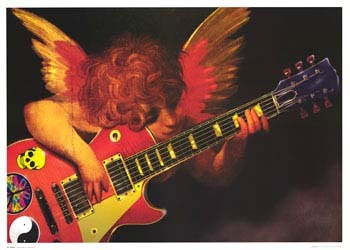 . . so I took the painting to my tat guy [Lou at Third Eye Tattoos] and he was like, Sure!" Fabiana loves this remarkable piece. She acknowledges that it's a bit different from the original but it still carries great meaning. Both Fabiana and her twin sister have the same matching tattoo to honor the memory of their father. Thanks again to Fabiana for sharing another piece of herself with us here at Tattoosday. "No," I explained to Heather, "I don't troll the post office for tattoos." She was asking why, of all places, I stopped her in line at the Fort Hamilton Post Office in Brooklyn. Really, it was a series of coincidences. My younger daughter was sick today, so I stayed home. Otherwise, I would have been at the main post office in Manhattan. But there I was, after an eternal wait in line, when I looked back and saw Heather talking to someone before getting into the endless line. I gasped. Heather has a lot of ink. She has sleeves (I think one was 3/4 and one was 1/2, I could be wrong) and a back piece that looks to be of significant volume, with other tattoos scattered across her self from neck to toe. When I asked her about her tattoo count, she gave me an answer that you generally don't hear, except from the heavily-tattooed. "I estimate I'm about 40% covered." Wow. A lot of ink, indeed. Heather gets tattooed by two main guys, and the piece she offered for Tattoosday was done by Lou Andrew at Third Eye Tattoos in Park Slope. You may be familiar with Lou's work, from Fabiana, whose ink has been appearing recently on Tattoosday. 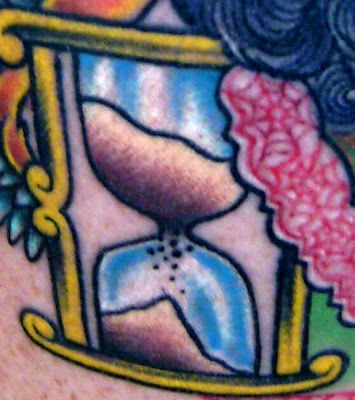 I love the grains of sand falling in the hourglass and the red cobwebs. Heather explained that this tattoo, on the back of her left calf, will have a companion piece on the back of the right, but not until fall. She acknowledged that her practice is not to get tattooed in the summer, when fresh ink is most susceptible to sun damage and fading. Much thanks to Heather for sharing her tattoo here on Tattoosday! I hope she will make a return appearance in the future, perhaps later in the year when she has the other piece inked. I ran into Marcus walking down 86th Street in Bay Ridge, just a block from Brooklyn Ink, where the above piece was tattooed by Joe. I hear Joe's name a lot, as his shop is closest to home for me. Although I have never been inked by Joe, everyone I've spoken to has nothing but good things to say. Marcus, who has about a dozen tattoos, had this piece tattooed on his right forearm, because he is an artist and inspired by art. Geisha, best translated as "artist" in Japanese, are representatives of the traditional artist class in Japan. This geisha has wings, making her angelic, which adds an element of spirituality to the tattoo. The combination of the physical art form with a representation of the spiritual, appeals to Marcus' sensibility, and this tattoo ultimately captures his outlook on life. Thanks to Marcus for taking a moment to share your heavenly geisha with us here at Tattoosday! You can see other postings of work from Brooklyn Ink on Tattoosday here. I ran into Angie at Duane Reade and she offered up the above piece as one of her favorite tattoos (she has over twenty). This flower is actually a composite, based on several different flowers. There is a clear lotus influence, as well, she acknowledged, a little bit of daisy. The color is based on that of the peony (right). Angie had this inked while she was in the Army, prior to going overseas to Iraq. She identified the artist as Jim White at Halo Tattoo in Syracuse, New York. However, Jim is not listed on the shop's site, so he must have moved on. 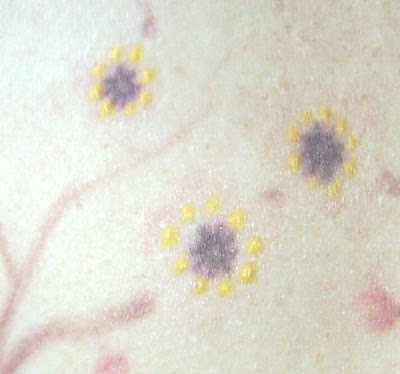 This is located on her inner left forearm and extends upward to the inside of her elbow. It's a beautiful flower, which was a life-affirming reminder that she carried with her to Iraq. I can only imagine how difficult the journey must have been, and I can see how one's body art provide strength as life's challenges are faced and overcome. Thanks to Angie for taking a moment to speak to me about her tattoo! Just a service note. 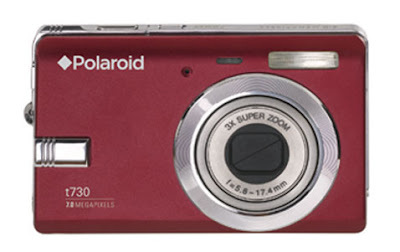 The official camera of Tattoosday has been upgraded from a circa-'05 Kodak Easyshare (took a lickin' but kept on clickin') that snapped decent 4.0 megapixel shots, to a fancy-schmancy Polaroid 7.0 megapixel t730. This upgrade comes courtesy of two friends, who generously pooled their resources, and bought this for me on my birthday. They are awesome, not only for giving me such a cool and much-needed gift, but because they have been tremendous supporters of Tattoosday from the beginning. Tom and Sephora are their names, and I want to thank them all over the place. Sephora, actually, was the subject of Tattoosday's first post, back when it was an aspiring spin-off on BillyBlog. Tom's ink appeared early on, here, back in September 2007 in this blog's infancy. Thanks to both of these dear friends, who are affianced, by the way. Their generosity and support of the blog are above and beyond the norm. They are exceptional friends, and I formally extend my gratitude. It seemed quite appropriate that, as I had some guests over to celebrate my birthday, Amanda, a friend of my wife's, was sharing with me a tattoo she had inked as a 30th birthday gift from her husband. I'm fairly certain that this is the first one of these tattoos appearing here and, when I say, "one of these," I am referring to the type of tattoo that looks like it has been painted on in a watercolor style. This was inked by Adam at Electric Rose Tattoo in Olympia, Washington. According to Amanda, Adam has tattoo training in Japan, and this watercolor-style piece certainly evokes cherry blossoms. Amanda elaborated on the origins of this tattoo. In 2001, she was dating James, who would eventually be her husband. She had become pregnant and suffered a miscarriage in September, and this experience, after they had been dating for only seven months, was very traumatic for them. She has other tattoos (this one was number six), and she wanted something to mark the moment, to memorialize the difficulty of the situation that was such a touchstone for emotion at the time. As the years passed and she thought of the occasion for this tattoo, searching for what she thought was the appropriate art to base it on, she envisioned a tree from which to draw her strength. Then, in 2004, she found the image upon which the tattoo was based, on a thermos, of all places. Amanda knew instantly that this was the art she wanted on her back. She finds that it symbolizes the rebirth of her self and represents what could have been, had she not miscarried. She recalls that this was more painful than any of the other tattoos she has (three on her ankle, two on her hip) and that the emotion behind the piece helped her transcend the pain as part of the healing process. It's a beautiful tattoo with deep meaning, and I thank Amanda for sharing it here on Tattoosday! It's my birthday today, and I'm fresh out of new material, so I thought I'd fall back on me. Thanks for reading Tattoosday! I ran into Tom coming off of the subway at 86th Street in Brooklyn. He had several tattoos (four, to be exact), and he offered up the above one as a special piece. Do note that he said, as many people do, that all of his tattoos are special. Tom told me this piece, on his right bicep, is a representation of one of the more famous aspects of the King Arthur legend - the sword in the stone. The sword of course, is Excalibur. Tom's parents, when raising him, gave him a thorough teaching of the Arthurian stories and the lessons from these tales carried with him through to his adult life. He indicated that the colors of the stained glass behind Excalibur are significant in that the blue represents courage, the red represents honor, and the purple represents valor. He had this inked the year that his father passed away from cancer, in part, as a tribute to the morality with which he was raised by his parents. The tattoo artist was Mike at a shop that closed its doors many years ago (somewhere in the vicinity of 18th Avenue and 77th Street in Brooklyn). Thanks to Tom for sharing this tattoo with us here at Tattoosday!